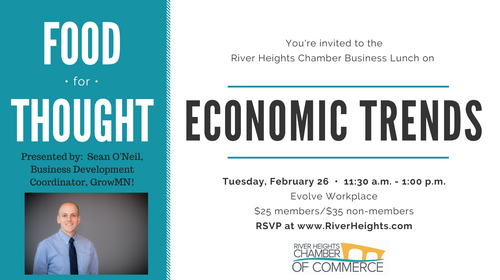 This meeting will highlight the economic trends in the River Heights region and how this compares to what we heard from businesses through our 2018 Grow MN! visits. 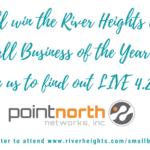 The goal is to understand broader economic trends impacting our area and what’s behind these trends as we talk to businesses on-the-ground that we do business within the River Heights region. This meeting will provide insights into our business community and reveal some of the major opportunities and challenges for future growth. Presented by: Sean O’Neil, Business Development Coordinator, Grow MN! Sean is responsible for coordinating business assistance, research and analysis, and data management efforts through the Grow Minnesota! Partnership. 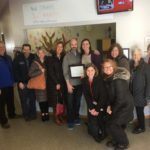 Sean joined the Grow Minnesota! team in November 2015. 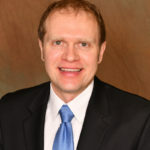 Prior to joining the Minnesota Chamber of Commerce, he worked for the St Anthony East and Holland Neighborhood Improvement Associations in Northeast Minneapolis where he coordinated neighborhood revitalization and community development initiatives. 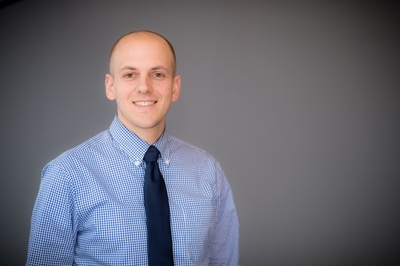 Sean holds a Masters of Public Policy from the Humphrey School of Public Affairs and a Bachelor’s of Arts in Political Science from Bethel University. Grow Minnesota!, the partnership was founded by the Minnesota Chamber in 2002 and is the premier private-sector led statewide business retention, business assistance and business expansion program in Minnesota. The program operates year-round in partnership with close to 70 local chambers and economic development organizations statewide.